Since the decades-ago release of the 1950 movie of the same name, “Rashomon” has become part of the English language, used to describe a situation in which different conclusions and interpretations arise from the same truth, the same event. “Rashomon,” like “kabuki,” “typhoon” (derived from “taifuu”) and “honcho” (derived from “hancho”), is another example of a word with Japanese origin becoming part of the English lexicon. In the original Akira Kurosawa-directed movie, the conceit of the story, which takes place during the past in samurai times, revolves around a terrible crime — a murder (or is it?) —as described by witnesses and those evidently involved. While the fact that there’s a dead body is undisputed, the various descriptions of the circumstances are at odds. The gist of the movie is that while facts are objective, the truth can be subjective. 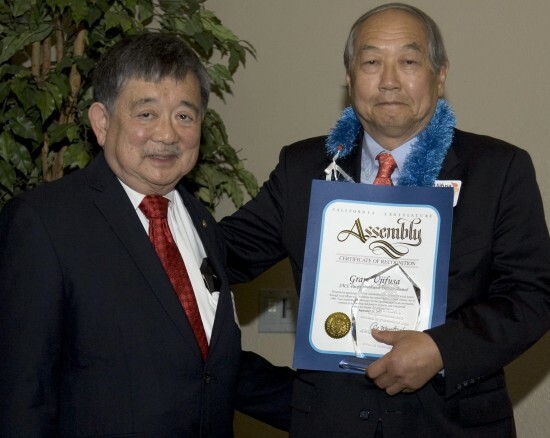 Ujifusa, for those unfamiliar with him, was the Washington, D.C.-based redress tactician whose insider knowledge of the capital’s power brokers gleaned from his experience as a founding editor of “The Almanac of American Politics” helped JACL and its separate lobbying arm JACL-LEC navigate the shark-infested world within the Beltway in the run-up to President Ronald Reagan signing the redress bill, the Civil Liberties Act of 1988. I met Ujifusa back in my days at JACL newspaper Pacific Citizen, and we chatted briefly and amicably the day of the JACL PSWD luncheon. It was good to see him. My impression of him then, as now, is that he’s very smart, focused, intense and prone to not suffering gladly those he considers fools. He also has a good sense of humor and is tough but fair. Listening to Ujifusa’s speech was like getting an insider’s view of the ins and outs and the ups and downs of how redress was not only approved but also paid for, and was an education in D.C. realpolitik. Also fascinating was Ujifusa’s account of how Reagan was swayed by his own words going back to when he accompanied Gen. Joseph Stilwell to Fountain Valley circa 1945 to present a medal to the family of Sgt. Kazuo Masuda, who was killed in action in Italy in WWII as a member of the 100th Battalion/442nd RCT. Stilwell heard of local opposition to Masuda getting buried in the town cemetery and decided to visit himself — with a young Ronald Reagan in tow — to use the weight of his rank and service to compel the town into rethinking their decision. In a recent column (http://tinyurl.com/mqr9eh5), I wrote about the 25th anniversary of redress. In that account, I referenced a couple of different sources that attributed Reagan’s change of heart to a Pacific Citizen news article from 1945 that quoted Reagan from his visit with Stilwell to Fountain Valley, a letter that made it to him via a fax sent by Rose Ochi. At the Aug. 10, 1988 signing ceremony, Reagan even name-checked Ochi. So, which account is the one that, in reality, carried more weight in getting Reagan to sign the bill? Letter from Masuda’s sister or article from Pacific Citizen? See why I think Rashomon? That Reagan signed the bill is a fact. Both Ujifusa and Ochi’s stories are undoubtedly true. For some the question is something along the lines of who ultimately carried the football over the goal line or who drained the winning basket with time running out. To me, however, that thinking loses sight of the fact that redress was an almost improbable victory, with many points along the way where it could have completely derailed, despite the best efforts of the many who pushed it along. Isn’t it possible that both accounts are not only true, but that both had their desired, cumulative effect? Maybe Kean’s efforts had already pushed Reagan toward signing it and he would have done it anyway without the fax. Or, maybe the fax of the P.C. article was the final push that Reagan needed to make his decision. We may never truly know what it was that ultimately compelled Reagan to act as he did, barring some personal diary entry. We can’t ask him now, of course, and within a few years of the end of his second term, Alzheimer’s took its toll, so asking him before he died would have no doubt resulted in an unsatisfying answer. As I wrote previously, success has many fathers. The success of redress was due to the efforts of many, unknown and known. That we had folks like Ujifusa and Ochi doing their parts, along with Bob Matsui, Spark Matsunaga, Daniel Inouye, Cherry Kinoshita, et al, not to mention Kaz Masuda and his fellow vets, is enough for me. I could tell before I got to the “full disclosure” that this guy hadn’t seen the whole film. Instead of looking up Rashomon on Wikipedia and trying to squeeze in irrelevant factoids (the actual Rashomon gate is in Kyoto…wow, see how much George Toshio Johnston knows?) why didn’t you just re-rent, and this time WATCH, the movie. If you’re going to put Rashomon in the title of your article and pass yourself off as a columnist/journalist, wouldn’t the two hours it would have taken you to screen this flick have been worth it. Go rent it now, view it, and realize how much better your piece would have been if you know what the heck Rashomon really was.